Protect Our Most Valuable Resource - Water! Backflow is the unwanted reverse flow of water, gases, or other substances into the distribution system of the potable water supply. A potential for backflow exists any time there is an actual or potential cross-connection between the potable water supply and any source of contamination or pollution. Backflow occurs when conditions exist that will cause back-siphonage or back-pressure. Back-siphonage: Back-siphonage conditions exist when there is a negative or sub-atmospheric pressure in the supply piping allowing downstream substances to be siphoned into the potable water supply. Back-siphonage occurs when vacuums are created by undersized pipes, pipeline breaks, and high withdrawal rates. Backpressure: Backpressure conditions exist when there is a higher pressure existing in the downstream piping than in the supply piping, allowing downstream substances to be pushed into the potable water supply. Backpressure occurs when higher pressures downstream are generated by pumps, thermal expansion, and elevation. 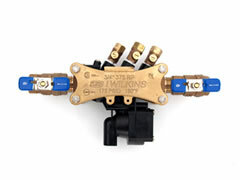 Wilkins products include backflow preventers, pressure regulators, and a variety of other support products. Wilkins backflow preventors are a high quality product and are suitable for residential, commercial, industrial, irrigation, marine and fire protection applications.